When we were growing up I remember every year for Father's Day my Mom would bake my Dad a Rhubarb pie. He LOVED rhubarb pie!! Now that I am all growed up, I love rhubarb too! I love to make rhubarb crisp, rhubarb/strawberry pie or crisp and this delicious rhubarb dump cake. 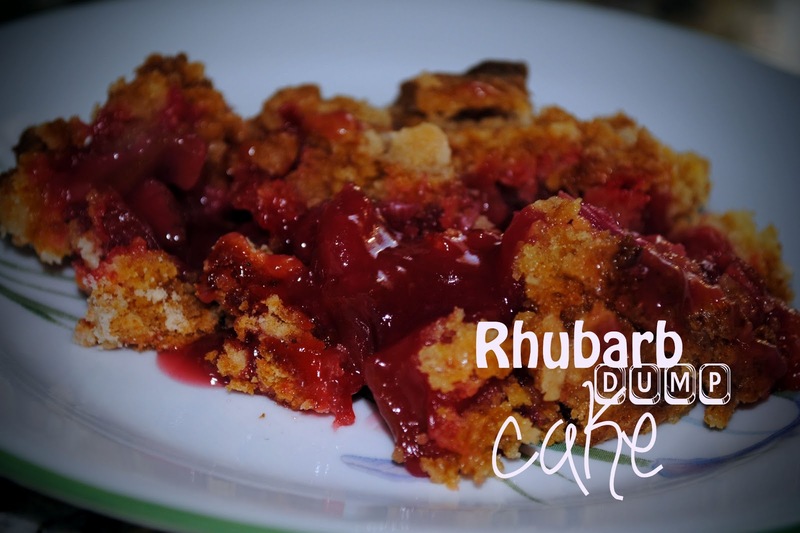 This is my children's favorite rhubarb recipe, so I thought I would share. Preheat oven to 350*. Grease a 9x13 baking dish. Spread rhubarb on the bottom of the baking dish. Sprinkle sugar over the rhubarb, followed by the jell-o, and finally the cake mix. Pour the water and melted butter over the top. Do not stir. Bake 45 minutes or until rhubarb is tender.